For the Love of … Fonts! The book as seen in a preview photo. Braving the cold wee hour of 7 a.m. last Saturday to stand in line to get a ticket for the library book sale (that opened at 11:00 a.m.) was worth it. I got #34 this month. But of course it still offered no guarantee that the books I had seen in the preview photos wouldn’t already be snatched up. But at least I had a good chance at getting some of them. 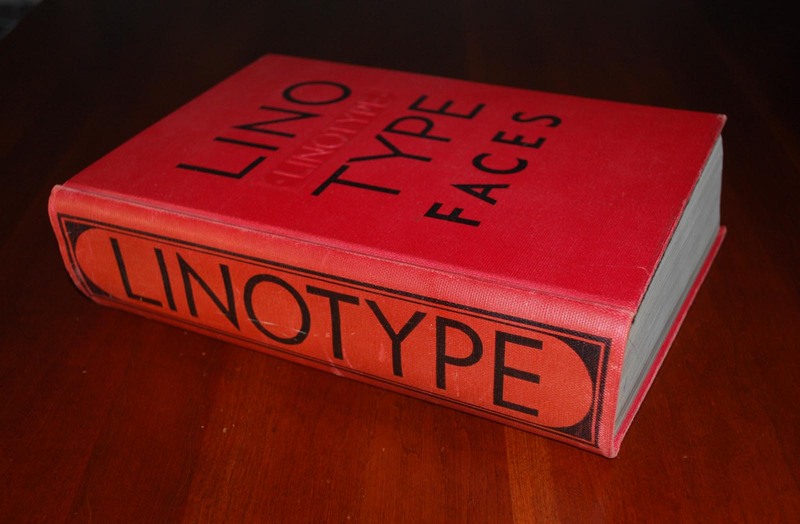 I was particularly keen on finding the vintage (circa 1930s/1940s) “Lino Type Faces” Specimen Book. “No, I’m not a dealer, but I do sell some in an online store. I like cookbooks.” Which is totally true, but not the whole truth. And I swear he smirked. “Cookbooks! !” he said. “I have a couple and never use them. I have four recipes I make all the time, ” he said proudly. And I felt like saying, “Well, good for you buddy!” And then he turned and started talking with the folks in front of him about java scripting and virtual machines and I was glad to be left alone with my thoughts. Finally inside the sale I managed to find and bag a few of the books on my list, but still had not found where they had tucked the Reference section with the hefty, red Linotype book. Where? Where? Where? Then I saw it. On a top shelf. Down the end of a 20-foot row clogged with people. I mean clogged. I started down the row going “Excuse me. Excuse me. Can I get by please.” I wasn’t moving too fast. People did not want to break their concentration or even move a few inches! As I made my way closer, I tried not to stare at the book to draw attention to it! 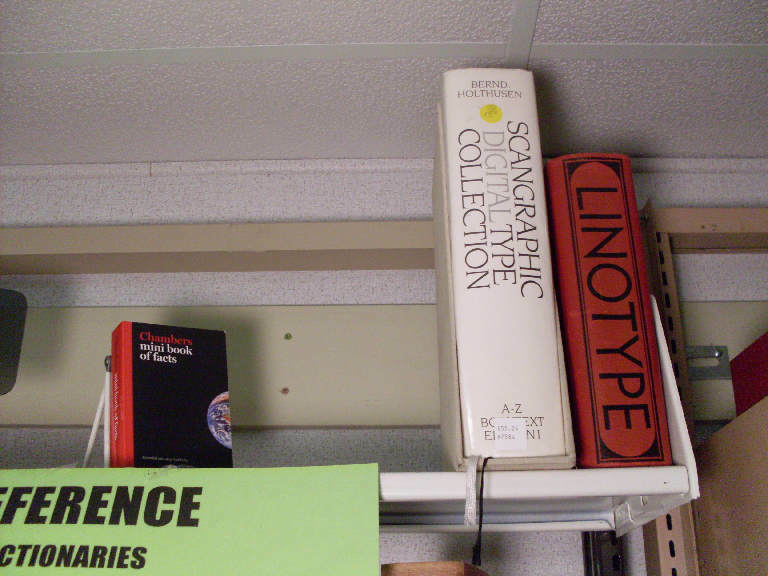 When I got to the shelves in front of it, I realized I could barely reach the book. I considered asking one of the taller guys around me to grab it, but decided against it. Standing on tip-toe, I grabbed the front of the book and slowly worked it out. Got it! 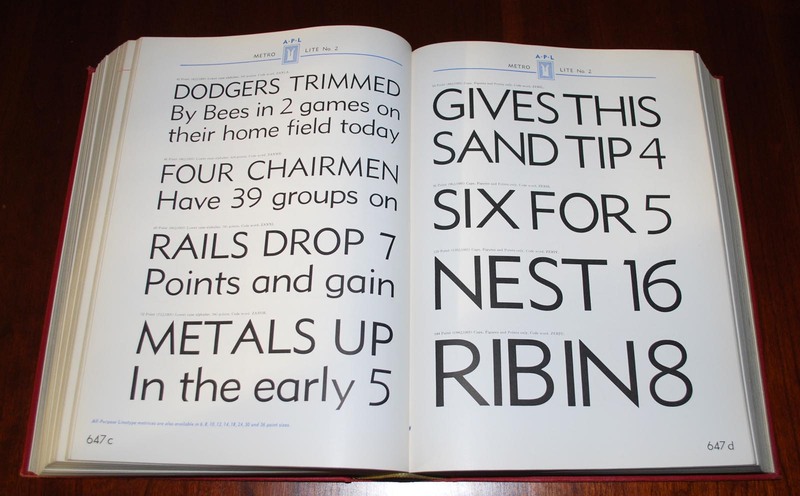 Six pounds of font magic. Love the clean Metro font. By far it was the most expensive book I’ve ever bought at the sale, but I think it was worth it. When I got home even my husband had to admit it was a cool find. At home on my coffee table. Eventually I’ll put it in my online store, but for now I’m enjoying perusing the book. What unexpected vintage find do you have displayed? Funny! I have totally gone to sales before thinking that because I am excited about a particular thing, obviously everyone will be waiting to grab it out of my hands… hehehe! Brandy, your “New Yorker Album” sounds like a gem!